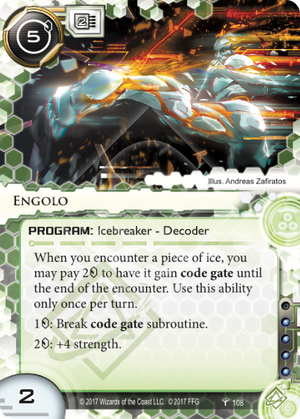 When you encounter a piece of ice, you may pay 2credit to have it gain code gate until the end of the encounter. Use this ability only once per turn. While Laamb received immense popularity from the moment it was spoiled, Engolo has not been on runner’s minds despite having arguably better numbers on it. It’s easy to see why though – Laamb has everything necessary to being the perfect support breaker. It’s not an AI but acts like one, taking care of traps and surprise ICE. Its numbers are also consistent – you can always expect to pay 2, 5, or 7 to get through any ICE (unlike Inti or other Shaper fracters). Sure, Engolo is also a pseudo-AI but you aren’t paying the expensive install cost and 2 MU for just an AI when you can get Aumakua for cheaper. Engolo’s primary inhibitor from it seeing more play is the fact that it’s a good pseudo-AI but not as great a decoder as other Shaper ones. Laamb can handle double duty in this regard – a Shaper fracter and the pseudo-AI. I’d like to give special mention to Kit though who can really make an Engolo deck work by being able to carve through any double-ICEd server with ease. As mentioned in the Laamb review, pair it with some Cyberdelia, maybe even Gebrselassie or Egret and you’ll be able to lock down any remote with ease.